Matching Dragoons: All-Star Western #11 "The Hundred Dollar Deal"
All-Star Western #11 "The Hundred Dollar Deal"
"The Hundred Dollar Deal "
First off, extra special thanks to Cesar for sending me scans of this issue all the way from Brazil. 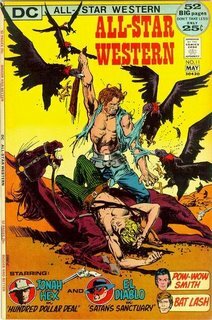 Second, since I'm trying to catch up on some posts, here is the second appearance of Jonah Hex. This story starts off with a young man in a derby getting the drop on Jonah and stealing Jonah's horse. As the young man rides off, Jonah grabs his gun and draws a bead on him, but the horse thief faints and falls off the horse. Jonah catches up to him and as the vultures gather on the young man, Jonah mounts up to ride off. The next page, Jonah has had a change of heart and is having target practice with the vultures when the young man wakes up. He tells Jonah that he only stole the horse to get away from three men who are after him, thinking he killed a man named Hillsworth. Jonah responds "Whut the blazes you tellin' me fer? Ah ain't no danged parson." The man offers Jonah $100 ($1,600 in today's $$) to take him back to his sister's farm. Jonah accepts the deal. 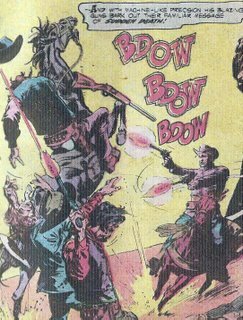 While they are riding, they encounter the three men who think that Jonah has probably aided in the murder of Hillsworth. The men suddenly recognize Jonah and pull their weapons. Jonah throws the young man off the horse and then shoots all three of the attackers. That night, Jonah and the man show up at the farm. A woman comes out and Jonah drags the unconscious man into the house. 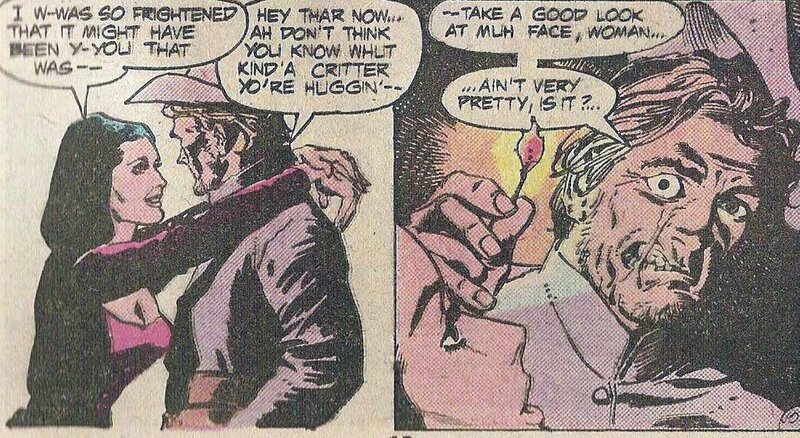 After the woman puts the man to bed (she refers to him as Terry), she thanks Jonah Hex for bringing him back. Jonah tells her to keep the thanks & pay him the $100. Jonah explains that her brother offered $100 to keep Hillsworth's men away. 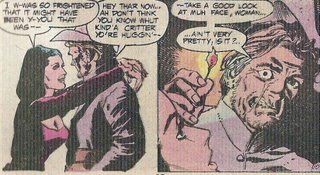 The woman can't believe that her brother killed Hillsworth but just then the door swings open and Hillsworth's son and a couple of men pull guns on her & Jonah. Jonah kicks the door shut, shots at the door & shoots out the oil lamp. Jonah jumps out the back window. The woman is huddled in the dark when she hears gunfire. The front door slowly opens and Jonah walks in. The woman throws her arms around Jonah and expresses her fear that Jonah might have been killed. Hex tells her to hold on and take a good look at his scarred face. She says that it's what is inside a man that counts and she grabs Jonah and kisses him. She hears her brother stirring and goes to tend to him as Jonah goes outside to bury the three men he just shot. While outside, Jonah mulls over his options. A week later, while Jonah is standing watch on a hill overlooking the farm, Terry tells his sister to pack her things to get ready to leave. She asks "what about Jonah?" Terry asks if she wants Jonah to discover that Terry & the woman are really married, that he lied only to get Jonah suckered in by her feminine wiles. As they head for the door, Jonah is standing there. Terry draws on Jonah but Jonah shoots the gun out of Terry's hand. Jonah takes both of them captive and heads them to town. The deputy tells Jonah that the sheriff will be back from Dodge tomorrow and once they check Jonah's story, then he'll get any reward. Jonah starts to head across the street for the saloon, but the woman starts crying, begging Jonah not to leave. Jonah leaves anyway and as he is knocking back a bottle a salesman walks into the saloon selling jewelry. He offers to sell Jonah a very nice ring for only $100. The story ends with the salesman being thrown out the window. Men killed by Jonah - 6 men shot. Timeline - Nothing to really give any clues as to when this story takes place, but it does appear to take place in Kansas, due to the refernce to Dodge.